Like the crazy Jewish woman I am, I start researching Passover recipes…well, you might say I research Passover recipes all year long. Passover is my least favorite holiday and so I am always trying to make the week as painless as possible with delicious “non Passover tasting” dishes. When I came across this recipe from Whole Foods a few months ago I immediately thought: this will be a perfect Passover recipe since I will only need to make one substitution! I hate using matzo meal or other Passover-rific substitutions, so I always looks for those perfect Passover-friendly recipes. In general I like making pies and cheesecake during Passover since you can easily replace a graham cracker or cookie crust for almonds, walnuts or pecans. 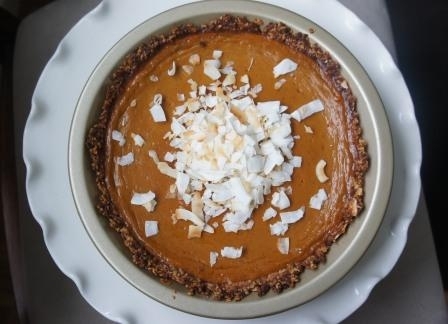 In this sweet potato pie recipe, I replaced the gingersnap cookies with almonds. Combined with sweetened coconut and melted margarine or butter – voila! a perfect moist crust that tastes just like a macaroon. The sweet potato filling is light and flavorful, just like a pumpkin pie. This pie recipe is so good you will make it all year, and THAT is a sign of the perfect Passover recipe. Preheat oven to 400 degrees. Make a few slits in skin of sweet potato and wrap in tin foil. Roast for 45 minutes or until soft. Allow sweet potatoes to cool slightly. In the meantime, place almonds, shredded coconut, salt and melted margarine or butter into a food processor. Press mixture into and up the sides of a 9-inch pie dish. Bake 12-14 minutes or until golden. Let cool. Scoop flesh from sweet potatoes and place into food processor. Pulse until smooth. Add coconut milk, eggs, brown sugar, cinnamon and nutmeg and process until combined. Reduce oven to 350 degree. Bake for 45-50 minutes or until center of pie is set. Allow to cool. In a saute pan, toast about 1/4 cup extra coconut on low-medium heat until golden brown. Sprinkle in center of pie as garnish.